The 2017 Beale Street Music Festival will be held May 5 – 7 in Downtown Memphis at Tom Lee Park. Today, Memphis In May International Festival officials revealed the lineup of artists appearing at the storied annual event. Join us on World Famous Beale Street this week for the International Blues Challenge 2017! Jason James is performing at Jerry Lee Lewis’ Cafe & Honky Tonk on Friday, February 3, and Saturday, February 4! Blues musicians from around the world will compete for cash, prizes, and industry recognition, performing in various venues along Beale Street, as The Blues Foundation presents the 33rd Annual International Blues Challenge January 31-February 4, 2017 in Memphis, TN. New Year’s Eve 2016 VIP Passes On Sale – Get Yours Now! Get your New Year’s Eve VIP Pass and spend New Year’s Eve at the one and only Jerry Lee Lewis’ Café & Honky Tonk! The VIP Pass includes a special buffet meal prepared by our chef including Creole Rosemary Chicken, Potatoes Dauphinoise Marcello, Memphis Slow-Smoked Pork for “Progress,” Black Eyed Peas for “Good Luck,” Turnip Greens for “Money,” Memphis-Style BBQ Beans for “Good Fortune,” and New Orleans-Style Bread Pudding with a sweet and creamy bourbon sauce! Memphis, TN — Jerry Lee Lewis’ Café & Honky Tonk is pleased to announce that Jerry Lee Lewis’ will play a New Year’s Eve Concert at the one and only Jerry Lee Lewis Café & Honky Tonk, located at 310 Beale Street, on December 31, 2016. Memphis, TN — Jerry Lee Lewis’ Café & Honky Tonk is pleased to announce Jerry Lee Lewis’ 81st Birthday Celebration and Concert will be held at the one and only Jerry Lee Lewis Café & Honky Tonk, located at 310 Beale Street, on September 29 and 30, 2016. Jason James Performs Live – April 22 & 23, 2017! Jason James will play this Friday and Saturday from 7-11pm! 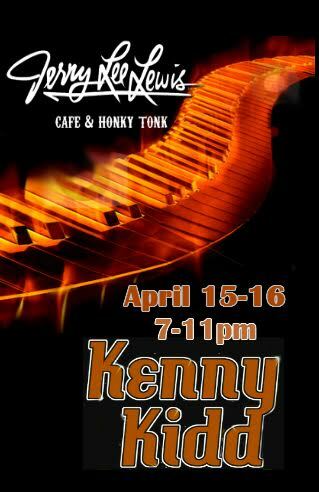 Kenny Kidd will play this Friday and Saturday from 7:00pm – 11:00pm! “Million Dollar Quartet” Series to Include “Killer Karaoke” Night at Jerry Lee Lewis’ Café & Honky Tonk on Saturday, February 13! CMT and Thinkfactory Media have announced Memphis and Shelby County will be the production base for the upcoming CMT television series, “Million Dollar Quartet”. Telling the story of the early Sun Studio recording careers of such icons as Elvis Presley, Jerry Lee Lewis, and Ike Turner, the series will focus on the often-turbulent career of Sam Phillips, the musical genius who first directed them toward stardom.